Using awnings and glass walls for protection from the rain, wind, and powerful rays from the sun, this system is a truly modular experience. Like other other louvred roof systems, motorised aluminium blades allow you to adjust and control the sunlight and wind entering the room, which can create a very natural air flow that saves energy and is more enjoyable than using a fan or air conditioning system. 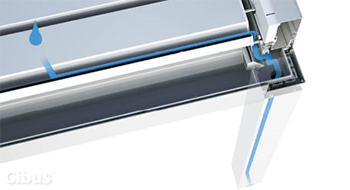 The blades have a rotation of 0-135° and when fully closed they form a fully water tight seal that prevents the area underneath from getting wet. The rain water is then drained away through internal guttering. A broad variety of extras are available and they help to ensure you can make the most of your Med system. LED lights to ensure it’s never too dark, and infrared heating (which a massive 30% more energy efficient than normal lights) to ensure it’s never too cold. Coupled with speaker systems, these ensure that the Med Varia is a truly diverse system. The Med Varia is suitable for all normal and common weather conditions, capable of dealing with sun light, rain, wind and storms, and is available as a “lean to” or self supporting system. This helps make the Med Varia one of the most versatile systems on the market. Whilst a Med Twist can be modular, the Med Varia is designed from the outset to be filled in, rather than left with open sides. 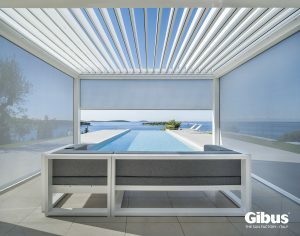 It comes with zip closures already built into the frame as standard, and is constructed in such a way that you can combine shading blinds and windows to protect from both the cold and the sun at the same time. Appearance wise, the Med Varia truly excels. With slimmer profiles and a wide range of finishes, this is also one of the most visually striking med systems ever. It is also available a broad range of colours and finishes, with different colours available for the blades and frames which can create some truly stunning two tone aesthetics. 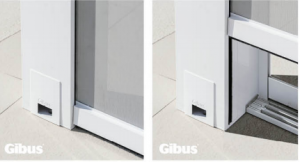 From black, to white, and plenty in between, the options allow for the system to suit any property and need. Drop awnings are available for the Med Twist, creating additional protection on the sides of the structure when specified. The drop awnings can be mounted with minimal intrusion on the design of the Med Twist, up to 4 metres wide. 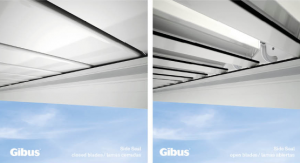 The shading options vary, from total Blackout to Crystal, all of which can be motorised. For further information, please consult the PDF, or contact our team on 01933 274276.